Google keyword rankings have long been a critical component of SEO, and marketers have thus used them as their main measurements of success. However, semi-recent Google updates have made it more difficult for markets to pinpoint direct correlations between these keywords and the ranking of their respective content. One of these updates, for example, broadened the range of which Google’s Keyword Planner tool shows how many people are searching for a particular keyword. Rather than saying a keyword has been searched for 1,500 times in a month, it now gives a broad range of 1,000 to 10,000. 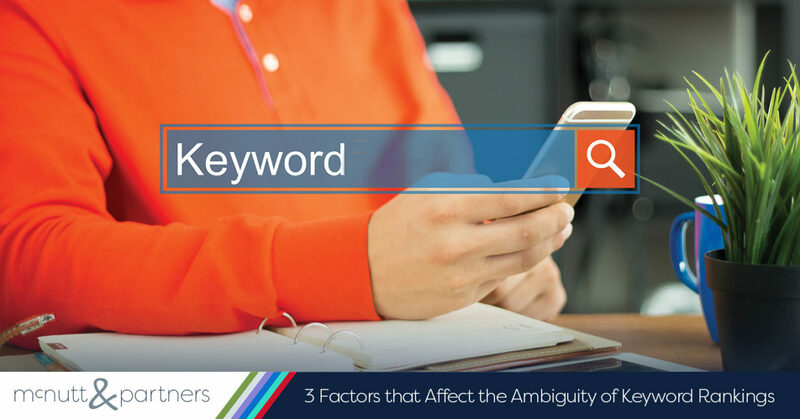 In addition to Google’s amendments to data presentation, here are three factors affecting the ambiguity of keyword rankings. Location. Location tracking on smart devices has come a long way, to the point where search engines can now pinpoint users’ exact locations at any given point in time that they are conducting a search. This is called “geotargeting.” In the past, a search for “Italian restaurants in Atlanta,” would have yielded results solely based on those Italian restaurants that were the top ranking in terms of search. Now, Google takes your location into account when delivering you results—prioritizing to a degree those restaurants that are within your proximity. Thus, it’s difficult to say that one result ranked over another due to its relevant keyword with location being a driving factor. Device. Similar to location, the type of device you are using is another factor that affects the ambiguity of keyword rankings. Google is able to see which device you’ve searched from at any given time you are searching. Geotargeting is based on the IP address or GPS location of the device that is in use. Obviously this ties in with location because that particular device will reveal where you are when searching, or whether you are moving. You can also consider device as a factor when delineating between desktop or mobile. Search engines, and particularly Google, have started prioritizing mobile optimization over desktop when showing search results. That means Google will show results based on how well they appear on mobile devices. If your site is optimized for desktop, but not for mobile, it may show up in a desktop search, but not a mobile search. Personalization. Google generally delivers search results that are personalized to that specific user based on his or her search history. For example, if your IP address has visited a site that sells Nike shoes, and you browse the search terms “running shoes,” then Google will likely place Nike at the top of your search results. However, someone who searches for “running shoes” who has not previously been to the Nike site may or may not see it in his or her search results. Cue personalization when it comes to the ambiguity of keyword rankings. In this scenario, is Nike really ranking highly for “running shoes” on its own, or is it due to that specific user’s personal search history? The answer is difficult to discern. It is important to be aware of these factors that affect the ambiguity of keyword rankings so you understand that the data you are looking at in terms of ranking metrics may not completely reveal what is really happening. Keyword ranking data is a useful tool to measure the success of your SEO efforts, but it should not be the only tool. If you need help strengthening your SEO efforts, the McNutt & Partners team can help. Call us today at 334-521-1010, or visit our contact page.